Is it worth going for the extreme clockspeeds? At this price point, you deserve something approaching perfection. Sadly, Patriot doesn't deliver. Remember the days when 400MHz DDR memory seemed impossibly exotic? 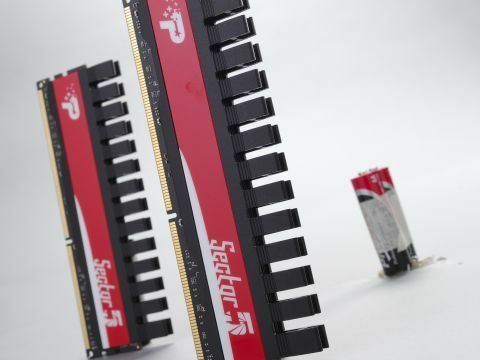 Fast forward to 2010, add another 2,000MHz and welcome to the state of the art in the form of the Patriot Sector 5 2400MHz triple-channel DDR3 kit. In fact, even today a claimed clockspeed of 2,400MHz is undeniably exceptional. But is it worth paying over £200 for? For that matter, is it actually achievable? The answer to the second question is a little tricky. One of the key barriers to hitting 2,400MHz has nothing to do with the memory itself. Instead, it's the integrated memory controller in Intel's LGA 1156 chipsets. Unlike the upscale 1366 stuff, the memory dividers top out at 12. That means the maximum frequency on offer without overclocking is 1,600MHz. The knock-on effect is that you'll need to run the baseclock at 200MHz to nail that 2,400MHz memory clock. That's a fair old lick by any metric, and stresses other parts of the platform, including the QPI link. To cut a long story short, in testing with our Gigabyte P55 board and Intel Core i7 860-processor, 2,400MHz is not possible with the Patriot Sector 5 kit. In fact, the best we managed was 2,000MHz. Whether this reflects a limitation of the board or these Patriot Sector 5 DIMMs is hard to say for sure. The higher the speeds you demand from your memory, the more likely other components are to spoil your fun. However, the problem for Patriot is that Corsair's Dominator GT 2133MHz does exactly what it says on the tin. In other words, it happily hums a 2,133MHz tune on the same motherboard that the Sector 5s stopped at 2,000MHz. At the very least, that doesn't look good. Admittedly, a few days spent hand tuning various timing and voltage settings could turn that around. But one thing is for sure: this kit is not a ticket to easy memory performance. Unlike other kits, you'll have to work at it to have any hope of hitting the claimed frequency. Elsewhere, the news is a little better. There are no horrors to report regarding the Sector 5's performance at more attainable clockspeeds. In fact, this is one of the most effective kits currently available when running at 1,333MHz. By cranking out 61 frames per second in World in Conflict and 17.65GBps of outright bandwidth, this kit shares first place with the OCZ Platinum 1600MHz. Likewise, at 2,000MHz, performance across our full range of benchmarks is certainly competitive.